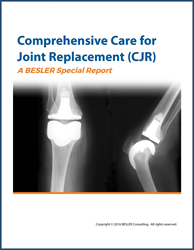 Today, BESLER Consulting announced the publication the Comprehensive Care for Joint Replacement (CJR) Special Report. In November, 2015, CMS introduced the Comprehensive Care for Joint Replacement (CJR) bundled payment program. This mandatory initiative starts on April 1, 2016 for over 800 hospitals in 67 MSA’s. This special report discusses how CJR works, explains the responsibilities of anchor hospitals, reviews items such as affiliation agreements, Net Payment Reconciliation Amount (NPRA), and the appeals process. For over 25 years, BESLER has helped hospitals enhance and protect their Medicare revenue. BESLER’s deep domain experience in revenue cycle, reimbursement, compliance and software development has resulted in more than $2 billion of additional revenue for our clients. For more information, visit http://www.besler.com.